This skirt is gorgeous! Love the whole look! this skirt is amazing, very beautiful outfit! What a picture-perfect outfit! You really know how to work pastels! oh i love this skirt. you look gorgeous! This skirt is gorg, so many pretty bright colors! I am loving the midi skirt movement going on. I have larger calves so I was hesistant to try it at first despite loving the look, but I've embraced it and am not looking back :). You look beautiful! Love the color and pattern on your skirt, beautiful outfit! What a pretty skirt, the length and stripes are so chic and love how you paired it with a simple denim jacket. Beautiful skirt and such a cute satchel! I LOVE your style girl! OMG. This skirt is my everything. I love your outfit. At first I was going to just say skirt and shoes and then I realized THE WHOLE THING just works! Perfect! I always love your match denim with higher end pieces. Great look. Your striped midi is the perfect mix of spring and summer style. Love!!!! This dress is just perfect for the summer. I think midis are great and they have a sense of subtlety about them. Beautiful midi and I love the mint purse. Such a lovely stripe skirt and the denim jacket adds a chic touch to the outfit, beautiful style! Cute skirt and I love how you styled it with the denim jacket!! You look so cute! 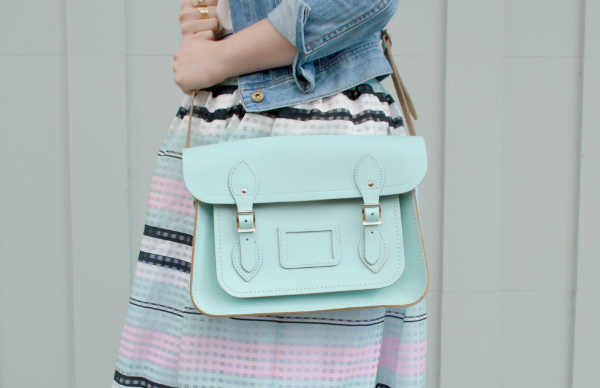 I love how this bag matches perfectly with one of the stripe colors in your skirt. Gorgeous skirt!! Love this look!! You look lovely!! Love the colors in this skirt! Ahhhh, obsessed with all of this. 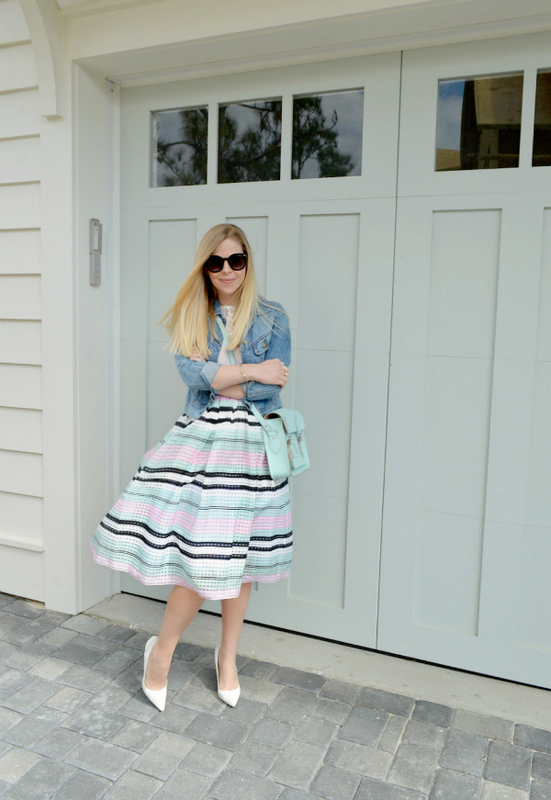 I have been obsessing over the midi skirt since last summer and I love how you styled yours! I love the vintage feel of midi skirts...you look fabulous! So pretty! Love the pastel colours of the midi skirt! So adorable, Anna. I've always loved this skirt. Beautiful look as usual Ana. This is an amazing post you have done on public . Thanks for shared .